This ornate postcard was mailed to Master Robert Jones of 433 South Duke Street in York, Pennsylvania. It was postmarked on September 5, 1922 — nearly 94 years ago. The message on the back, in flowery cursive, states: "May you live too [sic] enjoy many more happy Birthdays. From Mrs. Shaffer Supt. of Cradle Roll." 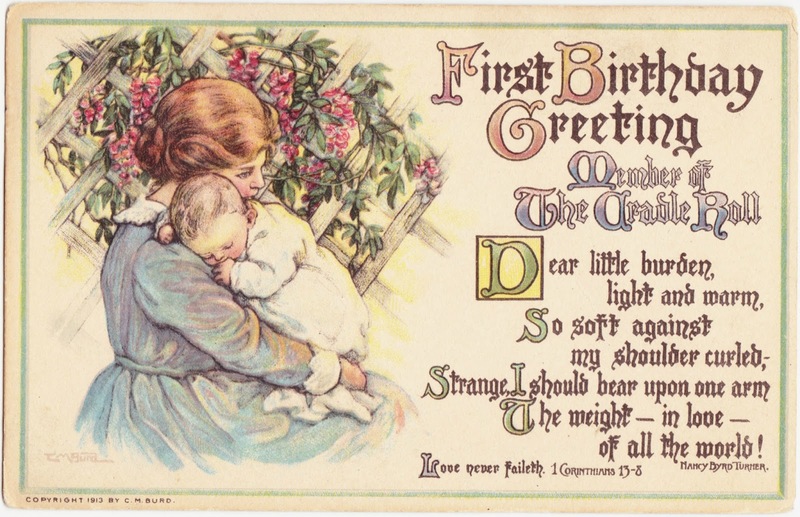 Cradle rolls are lists of the babies and toddlers of a church's members and have often been used for precisely this purpose — to send out birthday greetings. While it was mailed in 1922, the postcard itself is copyright 1913 by artist C.M. Burd. That's Clara Miller Burd, who lived from 1873 to 1933. More of her work can be found at americanillustrators.com, Pinterest and this website by Denise Ortakales. The verse portion of that is attributed to Nancy Byrd Turner.